Good: Instant nostalgia fix, use of editorial photos mean lots of celebrities and pop culture figures appear, tons of variety, boxes are a blast no matter what the hits are. Bad: Many of the autograph signers are either readily available in other sets or not very exciting, wardrobe cards come from the featured celebrity's closet and not from a specific film or event, models in the Hirsute History inserts look creepy. The Bottom Line: If you're a card collector, it's hard not to have a blast with 2011 Topps American Pie. Touching on the highs and lows of pop culture history, the delight comes from the attention to detail. The big events are to be expected, but I had the most fun finding some of my other childhood staples, like Bob Barker, Jim Henson and Dr. Seuss, that haven't had a lot of cardboard coverage over the years. The mix of basic inserts compliment the base set extremely well. And while the autographs and relics add to the chase, they play a minor role in the set's enjoyment. The base set features full-bleed photos with a large nameplate that changes slightly depending on the decade. Looking at the first images, I thought the nameplate was overpowering, but holing the cards, the design works. What really stands out are the photographs. I was expecting a lot of cheap, generic art. Instead, there are tons of photographs of actual celebrities and icons. They really stand out and paint a great picture about what drove pop culture from the end of WWII through the present day. The Hollywood Walk of Fame insert set pairs a celebrity photo with a shot of their star on the famous stretch of sidewalk. They work perfectly and offer a great tribute to some of the biggest names in the history of TV and movies. Fads & Fashions feels more like a subset and not an insert. However, the theme is a nice addition to the base set. Although I think the Hirsute History inserts are clever, the models showing off the hairy timeline look like the greasy guys you pray you daughter doesn't bring home. It's not so much their look but rather the freaky expressions on most of their faces. Most of the hits have a rather generic design that lacks pop. The plain color schemes and blocky layout do about as much for me as the overall lackluster checklist. Plus, several of the pictures on these cards are horrible. See the Carrot Top autographs and memorabilia cards if you don't believe me. I don't know how much more the base set could deliver. It covers so many major events from the last 60-plus years. It's the meat of the release and I don't know how much more collectors would want. Where the set lacks is in the autograph and relic card departments. Outside of a couple of celebrities like Jamie Foxx and Mickey Rooney, there isn't a lot. There are far too many reality TV stars, and second-tier ones at that. While a couple of people may appreciate signatures from Food Network shows, their inclusion waters down the rest of the set. This is a rare release where the hits don't really matter. Most of the value comes from pouring through and reading the cards. It's way cheaper than a Flux Capacitor for your time machine. Although many of the inserts don't carry a lot of value on the secondary market, they could help offset some of the cost. Buybacks from a variety of old Topps entertainment card sets create a foil stamped variation for niche collectors. The Beatles and Star Wars buyback cards, in particular, have sold well. And while they don't contain original memorabilia, the limited nature and strong checklists of the manufactured patch and coin cards have led to some decent sales. Collectors looking at 2011 Topps American Pie from an investment perspective will likely be disappointed with the autograph and wardrobe card selection. Simply put, 2011 Topps American Pie is a blast to break. I couldn't stop but look and reminisce with every card. From events that helped form the fabric of Western culture to personalities that have inspired millions, the base set has it all. The chase cards add to the fun by delving deeper into the celebrities. The big variety of inserts adds a lot of unpredictability to it all. Put it all together and you've got one of the most fun breaks of the year. After a break of nearly a decade, Topps is serving up more American Pie. 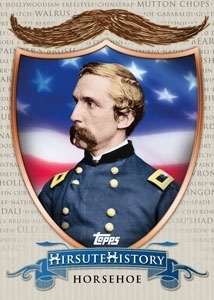 Instead of mixing baseball and pop culture, 2011 Topps American Pie has a revised recipe that makes it strictly an entertainment card release focusing on figures and events from the end of WWII through to today. Each hobby box promises a total of three hits, including autographs, memorabilia and relic cards with stamps, coins and manufactured patches. 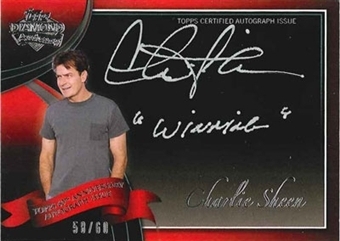 Celebrities on the initial autograph checklist include Charlie Sheen, Bob Costas and Mickey Rooney. Oscar winner Jamie Foxx has also been added. Check out our 2011 Topps American Pie hit tracker. 200-card base set encapsulating the history, pop culture and trends that shaped America from the end of WWII through to the present day. 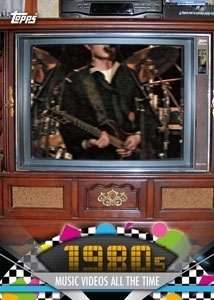 Parallels (combined 1:4): American Pie Foil, American Pie Spotlight (/76). Autographs, memorabilia cards, relics, autographed relics, cut signatures, coins and stamps combine to fall three per box. The Autographs checklist includes more than 40 signers, each autographing 200 cards. Also available in an Autographed Relic parallel (/50). Buyback Autographs feature signatures on classic Topps cards. American Pie Cut Signatures (50 cards, /1), American Pie Dual Cut Signatures (ten book cards, /1), American Pie Quad Cut Signatures (five book cards, /1) and American Pie Cut Signature Relics (five cards, /1) promise high-end hits from some of the biggest names in American history and entertainment. Hollywood Walk of Fame Patches (25 cards, /50) include manufactured patches meant to look like their famous star on the walk. 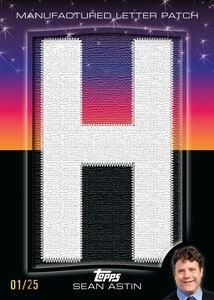 Hollywood Sign Letter Patches (25 subjects, /25 for each letter) feature jumbo manufactured letters done in the style of the famous Hollywood sign. A hobby-exclusive one-of-one Hollywood Sign Fold-Out Letter Patches parallel has the entire sign. 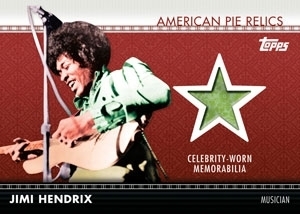 American Pie Relics (50 cards) have clothing and memorabilia pieces from the featured celebrity. 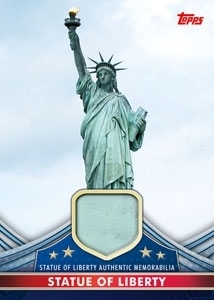 American Pieces Relics have embedded pieces from American items, locations and monuments like the Statue of Liberty. American Pie Stamp Collection (15 cards, /76) highlight important American figures or events with a stamp from the year the celebrity was born or the event happened. American Pie Coin Collection (75 cards) cards have embedded coins from the celebrity's birth year. Each figure has Penny, Nickel, Dime, Quarter and Half-Dollar versions, each numbered to 76. 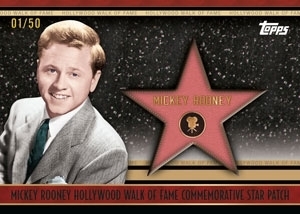 Hollywood Walk of Fame (50 cards, 1:3) features stars who have a spot on the famous stretch of California sidewalk. 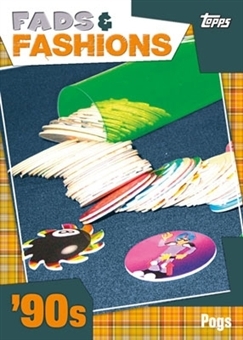 Fads & Fashion (30 cards, 1:4) highlight the one-hit wonders of pop culture consumption like Pogs. Hirsute History (20 cards, 1:6) is a cardboard guide to facial hair. Buybacks fall one per box and feature a mix of old cards from the Topps catalog. Each card is foil stamped to show that it's from this release. 2011 Topps American Pie Hobby Box - Factory Sealed! Congrats! That’s a nice find. How are you enjoying the rest of the set? What do you think of the Hendrix redemption card prices on eBay? I really want the card, but I’m not comfortable risking $200 or more for a redemption. Cindy (ID 34561) � Given that it’s for a memorabilia card, I’d say that the redemption should not take forever like some others do. They may even have the card ready to go but it was too thick for packs. Even still, there’s never a guarantee on these sorts of things. Also, does the card mention what the relic’s of? Depending on what it is, prices could go either way when the cards start coming out. Although I don’t know for certain, I’d say that a relic like this should end up coming out and you shouldn’t be left hanging. That said, that’s my opinion. It’s bound to be a great card. The redemption doesn’t say what the relic is. All we have to go by is the picture on the Topps site that you posted at the top of this page. Topps doesn’t have pictures for the other redemptions, so maybe they do have the Hendrix item in hand. This is the first non-sports card box I have opened since the Marvel Universe/X-Men products from the early 1990s. I didnt know what to expect from this box, but I had a blast opening it. The cards range from many historical events from American Pop Culture covering the 1940s though today. This product can also make for a great educational tool for young collectors or adults who want a quick history of America. 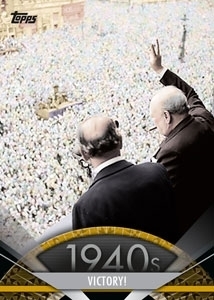 The base cards feature 200 moments/events from America chronologically from the end of War War 2 to the present day. The cards depicting the 1940s and 1950s are mostly in black and white. Some cards from the 1940s include Marlon Brando, First Nascar Race Held, World War 2 Ends, and The Emmy Awards. The 1950s include Dr. Seuss, the First Color TV, Lucille Ball & Desi Arnaz, and Disneyland Opens. Some highlights from the 1960s include John Wayne, Jimi Hendrix, The Brady Bunch, and Jeopardy. 1970s brings us cards of the First Happy Meal, Rubik’s Cube, Garfield Debuts, and Saturday Night Fever. 1980s cards include Nintendo’s NES Released, The Simpsons Premieres (My Favorite Card), Pac-Man, and Michael Jackson’s Thriller. 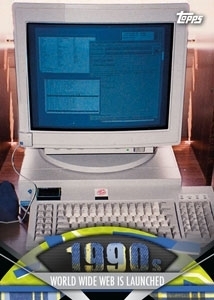 1990s brings us cards of World Wide Web Launched, Titanic, Google Founded, and DVD Introduced. The cards from the 2000s gives us First iPod Released, Y2K Dud – New Millennium, Facebook Founded, and Twitter Launches. There is a nice assortment of insert cards from this product. Every pack had an insert or hit card in it. There are Foil and Spotlight Parallel cards of each base card. The insert set that is my favorite is the Hollywood Walk of Fame cards. The inprint of the star with the celebrity’s name on it is a nice touch and makes for a great card design. I didnt care too much for the Fads & Fashions or the Hirsute History inserts. Topps also included 1 Buy Back card in each box which comes from a past Topps product. We got an old school Jaws 2 card in our box. There are some amazing looking Hit Cards in this product. The American Pie Relics is your usual standard relic card design. Where this product really shines is in the Hollywood Walk Of Fame Patches, American Pie Earth Memorabilia, American Pie Stamp Collection, and American Pie Coin Collection. I have never seen anything like an Earth Memorabilia card before where a piece of the Earth is actually on the card itself. Some examples are the Lewis & Clark Trail and Grassy Knoll. The Stamp Collection and Coin Collection cards include old school stamps and coins that coincide with the individual who is on the card itself. All three of these are very innovative designs and features of this Topps product. Most of the autographs are from celebrities and actors/actresses. Some of the more well known names include Mickey Rooney, Jamie Foxx, Carmen Electra, Naomi Judd, Dean Cain, Henry Winkler, Tia Carrere, Shanna Moekler, Sean Astin, Gilbert Gottfried, Louie Anderson, Susan Lucci, Carrot Top, and Tom Arnold. Not the greatest lineup of signatures to promote a product, but some nice ones to have in a collection. Overall this was a very fun box to break. If you are looking for resale value, this box is not for you. The Relic and Autograph cards are hit or miss. But if you are lucky enough to pull one of the Stamp or Coin Collection cards, you got a very rare find in your hands. I found myself reading the back of every base card I pulled to know more about that event on the card. For a product that can be seen as more educational, this was one of the best breaks I have ever broken.